Labeling patients may lead to serious missed diagnoses. Labeling patients may lead to seriously inappropriate care. Give a patient anti inflammatory drugs for a fracture in the ankle. It needs to be immobilised and perhaps pinned or plated. In fact, NSAIDs inhibit the healing of bone just as they do with torn tendons and ligaments. Likewise, anti inflammatory drugs and painkillers and a corset for a bulging lumbar disc aren't the best care. That injured disc need to be reduced, and the patient must go through certain disciplines to prevent the slip from reoccurring; and then the correct and appropriate exercises given for a strongly knit annulus fibrosis and strengthened core muscles. Otherwise the risk is high that it'll turn into a prolapse with pain down the leg. To some medical doctors nearly everything in the musculo skeletal domain is viewed as inflammation and so, despite their own research, NSAIDs are prescribed. Conversely, to some chiropractors, everything is viewed as a bone out of place, or subluxation, and so the treatment regardless of the condition, or the research, is the spinal adjustment. One of the most bold and misleading diagnoses is arthritis. You've been told you have a degenerative joint and there's little to be done. In the first place there are over one hundred forms of arthritis, and it needs to be correctly stated which kind you have. Secondly, patients commonly have more than one form of arthritis; one of which be may be less manageable, but the other has several possible proven treatment options. Do you have rheumatoid and osteoarthritis? So, labels are important; but the appropriate and correct diagnosis is vital. Let's have some fun. If you follow my Bernard Preston website, and you should if you're into healthy living and good books, then you'll know that she who must be obeyed is into making jams and jellies. Although they have a lot of sugar, about a teaspoon per helping, they are also rich in the phytochemicals that reduce the chance of getting cancer. Here's a batch of mulberry jam. They are all the same, unblended whole fruit made in 2013. But put them into the pantry like this and you're immediately at sea. 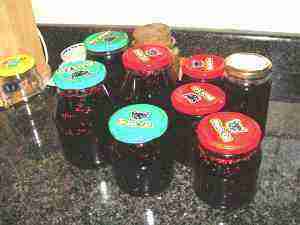 Next week, you come back; are these the blended jams, or the mulberry jelly, or preserve from last year? Or is it cherry guava which has much the same colour in the dingy light of the pantry? Or was it made by granny twenty five years ago? So, labeling mulberry jam is important. Labeling patients' diseases is also very important and useful but, by George, it can be misleading. Labeling patients often leads to doctors making wrong assumptions about your health. Let's get to the heart of this page. We'll call the patient 1, Mrs Jones. When she was thirty five years old she started getting stiffness and low back pain and pain on the soles of both feet. There's nothing unusual in that but her doctor thought an opinion from an rheumatologist was in order; no problem with that either. Xrays revealed bilateral heel spurs. Mrs Jones' rheumatoid factor was raised, but not high enough to be definitively diagnosed as inflammatory arthritis. Nevertheless, because of the by then chronic nature of the disease, a trial of very toxic medication was recommended. Mrs Jones has endured twenty five years of lower back and foot pain; whenever she consulted anyone, she was labelled again as a rheumatoid patient, and there was nothing to be done. Gradually, her liver swelled from the side effect of the medication that she continued to take. Patient 2 we'll call Mrs Thomas. She has had chronic lower back pain for a long time. Three years ago she took a tumble and it was much worse for a month, using analgesics prescribed by her doctor. And then the big one hit; after cleaning out her garage she developed very severe back pain. Coughing and sneezing were painful, as was flexing her head onto her chest; those are all signs of a bulging disc. Again she was given more anti inflammatory drugs and encouraged to continue as normal. The condition, again the danger of incorrectly labeling patients, was considered inflammatory. The next morning sitting on the toilet was very painful; she twisted to wipe herself, felt something give, and immediately a cold numb feeling spread down the front of her thigh. By the time she got to me later that day it extended down the inner lower leg, following the classic fourth lumbar dermatome. More alarming, her back pain vanished completely, but her leg was on fire. Ominously, by the time she got to me, the quadriceps muscle was already weakened, the reflex reduced and the very serious crossed slump test was positive. Raising her right leg provoked the pain in her left thigh. I won't spell our the rest of the details, but I told her that I could give her at best a fifty percent chance of escaping surgery and she would certainly have to stay at home, not sitting, for at least a month. An extruded disc into the foramen is a very serious condition. Interestingly, she chose to have no treatment, no drugs but to stay at home, not sit and do the exercises faithfully. It's now a month and she tells me the pain in her leg is nearly gone. The body has amazing healing properties if you're just sensible and do the right things. We watch with interest. I myself had this same injury and with chiropractic treatment from my daughter escaped the knife by the skin of the hair on my chinny chin chin. This is the scan of my own femoral nerve damage. 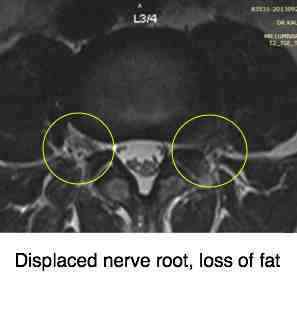 Viewing and labeling patients with a slipped disc as simply an inflammatory condition is in my book a serious mistake. Back to Mrs Jones. What no one considered is that insidious lower back pain, tightness in the chest and bilateral calcaneal spurs should trigger suspicions of another form of arthritis called ankylosing spondylitis. She clearly doesn't have any of the typical signs of rheumatoid arthritis. An HLA B27 test was never made. Add to that the usual falls and heavy lifting injuries, a sprained ankle and we have an interesting mix of very treatable and untreatable conditions; none of which are rheumatoid arthritis. The xrays clearly show she has osteoarthritis, and the pain in her ankle, already 80 precent better was from a subluxated talus. Labeling patients can be very misleading. We have now arranged for a blood test. I suspect a mild case of AS. Get a second opinion, and if necessary a third and fourth. This is especially true if you've had no proper examination and the doctor was in so much of a rush that he wouldn't hear you out; that's what often leads to labeling patients. I'm also a great believer in gut feel; when your inner sense tells you that all is not well in the state of Denmark, then follow your instincts. Getting it right requires insight and wisdom on both the part of doctor and patient. Most doctors are conscientious, work hard, do their best but still get it all wrong periodically. I do. Get a second, and if necessary a third and fourth opinion. So, where is all this leading? A healthy dose of skepticism is never out of order, not that I'm suggesting you should question and doubt every diagnosis and decision of all your doctors. But when that little inner voice is speaking to you, listen. When you own sense, your own intuition is speaking loud and clear, it never hurts to get a second opinion. Or a third. Do you have doubts about your chiropractor's explanation of the tingling in your arm? Ask your medical doctor for an opinion. Your inner sense tells you that your chest pain isn't coming from a heart condition? Ask your chiropractor if it could be Tietze's syndrome. Tingling and numbness down the side of your thigh and your doctor tells you that meralgia paresthetica is untreatable? Baloney. Talk to your chiropractor. A short leg is a common cause of a scoliosis; ask your teenage children to bend forwards whilst you observe them. 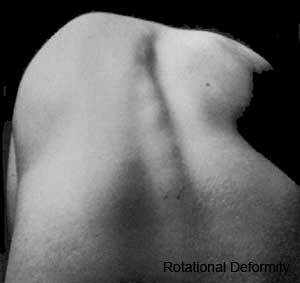 Whilst labeling patients with a curvature may vex them, it's better than a life of pain. This is probably my own serious error. Some fifteen years ago I diagnosed patient 3 suffering from lower back pain with a short leg, prescribed an orthotic to go in her shoe, and went off to the Netherlands for an extended period. Now she has consulted me again for another condition. Again that short leg. No, said she, the original orthotic didn't help. In fact, it seemed to make her back pain worse and finally she turfed it out. Now I want her to wear it again because she has a marked scoliosis and unleveling of the pelvis. A lift in her shoe will reduce the chances of arthritis in her spine, hip and knee; so the research shows. Lo and behold, on looking at an old pair of tackies, the velcro was in the opposite shoe. For a whole year she wore the lift on the wrong side. Somebody screwed up badly. It was probably me, but perhaps the orthotist, or she herself made the mistake; the old records have been disposed of. Sometimes an xray taken lying down can muddy the water. My point in conclusion is that when your inner sense tells you that that you have been labelled incorrectly, listen to that little voice. And especially if you are taking a handful of different drugs over an extended period. Or, if your chiropractor prescribed an orthotic and it's clearly aggravating your condition. One of the most difficult things I've ever done, was to dump my patients in South Africa and go off to the Holland to work for an extended period. For me it was a very enriching experience, which you can share if you care to purchase Stones in my Clog, but there were many responsibilities that I simply neglected. Of course, doctors do move about, and it would have been no different had I simply moved to another town. But it was difficult, knowing that I was neglecting my patients in South Africa. In Bats in my Belfry I tell of the pain of leaving those responsibilities to patients behind, and in Stones in my Clog you can walk with me through the delightful polders of Holland. See below for the links. You won't be sorry; I have yet to hear from one single person who didn't like my books. I've just been notified that over 200,000 people have viewed my videos. Have you seen any of them? There are exercises for a frozen shoulder, for lower back pain in pregnancy and even the Slump test for sciatica that you can do at home. The great advantage of exercises is that correctly done, whether labeling patients has been spot on or not, they always help. We just aren't active enough, and our health suffers. The purpose of these videos isn't to entertain; they are one small attempt to enable you to help yourself when it come to your health. A little knowledge can be dangerous but in these days without adequate medical insurance - I have none myself - then these may help you; that's the whole purpose of Chiropractic Help anyway. This is my take on personal medical insurance. But when you know you're out of your depth, get help from your local chiropractor. Don't allow your condition to become chronic; or you may have it for the rest of your life. Use the Search function at Chiropractic Help to find them.